MONROETON, Pa. – The start of Keith Lamphere’s senior year at Towanda High School will have to wait. Benjamin shares space in Lamphere’s Monroeton, Pa., shop and will join him on the 1,000-plus mile trip out west. “15 or so” crew members. 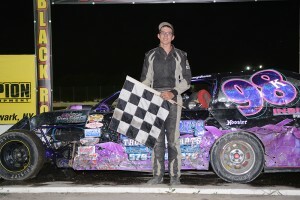 After recording the first two wins of his IMCA career in 2014, Lamphere had seven checkers to his credit through his first 38 sanctioned starts this season. As a spectator, he developed an appreciation for the regular farming sessions each night of Super Nation­als. As a first-time competitor at Boone, Lamphere looks forward to benefitting from that careful attention. Sponsored by Lamphere’s Truck Parts of Monroeton, Close Racing Supply of Eldred and Chad Ely Race Engines and Insinger Performance Fuels both of Dushore, Lamphere shares the ultimate goal of making the Saturday night main event. No driver from Pennsylvania has made it into the big dance.